Dad: "How's about a fish?" Kathleen: "That's a no. They don't even know you have them. All they do is swim around the tank and blow bubbles. It's hard to even say you have them!" "Do you know Angeline's daughter? The girl daughter, not the boy daughter." "What time is it today, Daddy?" "Boys and girls: they're just not a very good mix"! "I can hear someone not talking to me!" Really exhausted today - half the family suddenly came down with a stomach bug last night with the result that I spent the night awake shuttling to and fro with buckets of.. well you get the picture! However, today there was great excitement in my household, so I thought that maybe I should use that as a catalyst for posting something here! 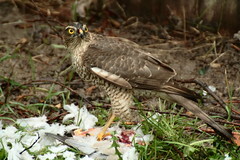 The excitement was caused by a sparrow hawk that landed in our garden and proceeded to eat a pigeon she had caught. We all watched with interest, and I tried to get some video footage and a few quick shots of it. Whilst videoing, I was shocked to discover that for the first 5 to 10 minutes, the pigeon was still alive - it was literally being eaten alive by the hawk! I must admit that I was a bit shaken by that. We didn't do anything to intervene, though, since I do prefer to let nature take its course with this kind of thing. A quick comment - in order not to embarrass them too much or cause other alarm and despondency, I will, in a lot of cases, used alternative names for other people that I talk about from time to time. This is the first real post that I have made on this blog. Actually, it's not the very first post - I did some "dummy" posts earlier so that I could play around with the design of the template. However, I've now deleted them, so this is the first "real" post. I've also come back and edited it a few times, so it's really sort of an adaptation of not quite the first post! This blog contains (or, at least, will contain) various of my thoughts about life in general and Christianity in particular as well as poems, songs and other bits and pieces. Now, enough of all that - I'll let you get on and read some of the actual content. I hope that you find something interesting, thought provoking, amusing, encouraging or otherwise enjoyable in at least something that I have to say. [May] the LORD bless you and keep you; the LORD make his face to shine upon you and be gracious to you; the LORD lift up his countenance upon you and give you peace.